This Hunt is for a $2500 Beautiful Trophy Fallow Buck. This specie of deer can be white, spotted, or chocolate. In fall males have hard antlers with flat palmations similar to moose and easily have 20 to 30 points. Like whitetail deer, the antlers are shed in the spring of each year. A large male will weigh 200 lbs while a female will weigh up to 100 lbs. 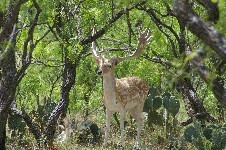 George Washington originally introduced fallow deer on his Mt. Vernon estate. The bucks are gorgeous with great antlers. While on this hunt you can also take other animals at addtional fees such as: Aoudad, Axis, Blackbuck Antelope, Corsican, Ibex, Mouflon, Sika, Texas Dall, Black Hawaiian, New Zealand Mountain Goat, Merino, Painted Desert, Four Horn, Catalina, Whitetail, Hogs, Turkeys, and much, much, more! Bring the entire family and have the experience of a lifetime. We have hunts to fit every budget, from Meat Hunts to Trophy Hunts. The sizes of Trophy Fallow Bucks will vary. There will be Trophy Fallow Bucks larger and smaller than pictured.